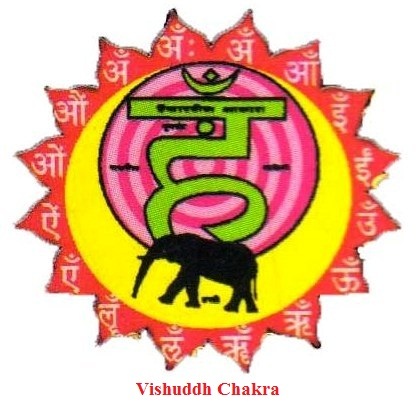 Vishuddh or Throat chakra : Vishuddh chakra is the 5th chakra in our body and located at the cervical region area. The Vishuddh or Throat chakra is situated in the cervix plexus which is directly behind the throat pit. The physically counterparts of Vishudhi chakra are pharyngeal and laryngeal nerve plexi.It is the centre of purification and Eather elements. Vishuddh or Throat chakra is represented by a sixteen petalled lotus which is said to be purple in colour. On each petal, one the sanskrit vowels is inscribed am, aam, im, eem, um, oom, rim, reem, lrim, lreem, em, aim, om, aum, am, ah. Within the lotus, there is a pure white circle which represents the element of ether or Akasha. This element region is the gateway to liberation for one whose senses are purified. Within this moon like circle, the beeja mantra of the Vishudhi chakra is written which is ham. It takes care of thyroid gland upper palate and epiglottis etc. Beej mantra of this chakra is the HAM. Between bindu and the Throat chakta, there is another center known aslalana chakra and it is very closely related to Vishudhi chakra.When the nectar is produced in bindu, it flows down and get stored in the lalana chakra.This divine fluid has dual nature, it can act as both nectar as well as poison. Upto lalana chakra, it remain undifferentiated, neither poison nor nectar. With the awakening of the throat chakra, not only the internal poisons are nullified but also the external poisons can be neutralized and rendered ineffective. This is a siddhi or power associated with this chakra. When the Vishudhi chakra opens, you will become able to receive the thought vibrations from other people’s mind. This actually happens through another center in the body which is closely related to Vishudhi chakra. It actually behaves like a transistor radio which is tuned by the yogi enabling him to receive the thoughts and feelings of the persons both nearby and far away. When the throat chakra is awakened, a process of rejuvenation starts which balances this ongoing aging process.The hearing sense becomes very sharp with the awakening of Vishudhi chakra. The nadis are purified and awakening of this chakra aspirant gets freedom from worldly desires. Yogi gets the full knowledge of the four vedas. The past, present , and future become known by meditating at this chakra. This entry was posted in Smart astro guru, Yoga & Kundalini Shakti and tagged Throat chakra, throat chakra in body, Vishuddh chakra, vishudh chakra, vishudh chakra in kundalini shakti by R. N. Sharma. Bookmark the permalink.